We’d love your help. Let us know what’s wrong with this preview of My Grandfather's Blessings by Rachel Naomi Remen. Dr. Remen's grandfather, an orthodox rabbi and scholar of the Kabbalah, saw life as a web of connection and knew that everyone belonged to him, and that he belonged to everyone. He taugh In My Grandfather's Blessings, Rachel Naomi Remen, a cancer physician and master storyteller, uses her luminous stories to remind us of the power of our kindness and the joy of being alive. To ask other readers questions about My Grandfather's Blessings , please sign up. How can I attach my book review to FB? Thank you. "We avoid suffering only at the great cost of distancing ourselves from life. In order to live fully we may need to look deeply and respectfully at our own suffering and at the suffering of others. In the depths of every wound we have survived is the strength we need to live. The wisdom our wounds can offer us is a place of refuge. Finding this is not for the faint of heart. But then, neither is life" (138. In this book Rachel Naomi Remen chronicles, anecdotally, her experiences in her medical pr "We avoid suffering only at the great cost of distancing ourselves from life. In order to live fully we may need to look deeply and respectfully at our own suffering and at the suffering of others. In the depths of every wound we have survived is the strength we need to live. The wisdom our wounds can offer us is a place of refuge. Finding this is not for the faint of heart. But then, neither is life" (138. In this book Rachel Naomi Remen chronicles, anecdotally, her experiences in her medical practice. This is not just another Chicken Soup for the Soul book (although Remen has written another book called Kitchen Table Wisdom ). It had a profoundly moving effect on me. Remen deals with a lot of women's issues, but mainly with living a more full life by acknowledging the light that exists in each human being. I think this book would resonate with anyone interested in becoming a refuge for other people or in accepting the natural course of his or her life. My favorite chapter is "The Path," in which Remen describes remodeling her house and trying to figure out how to create access to her front door. There was either a direct way, one where you could see the door from the beginning of the path, and an indirect way, one where you climbed some steps with a magnificent view of the San Francisco Bay and only at the last minute saw the door. She says, "Thinking about it now, it seems to me that knowing where we are going encourages us to stop seeing and hearing and allows us to fall asleep. In fact, when I find myself on such a direct path, a part of me rushes ahead to the front door the moment I see it. As I hurry to overtake this part, I usually do not really see anything that I pass. Not knowing where you are going creates more than uncertainty; it fosters a sense of aliveness, an appreciation of the particulars around you. It wakes you up much in the same way that illness does. I chose the second way. . . . The truth is that we are always moving toward mystery and so we are far closer to what is real when we do not see our destination clearly" (289). This book has been especially poignant to read because I had a neighbor/friend die of cancer at Thanksgiving. Another neighbor just finished his first round of chemotherapy. My dad died a little over a year ago of cancer. Another neighbor just a few months before my dad. This is a book that, I have decided, needs to be read in snatches. Read. Think. Weeks go by. Forget. Re-read. Re-think. Remember. I had put the book aside for a bit and now it's time to read a few more pages. One of my favorite This book has been especially poignant to read because I had a neighbor/friend die of cancer at Thanksgiving. Another neighbor just finished his first round of chemotherapy. My dad died a little over a year ago of cancer. Another neighbor just a few months before my dad. This is a book that, I have decided, needs to be read in snatches. Read. Think. Weeks go by. Forget. Re-read. Re-think. Remember. I had put the book aside for a bit and now it's time to read a few more pages. Absolutely beautiful book! It is a series of very short essays, coming from her experiences growing up and also practicing medicine.and I read 1-2 each evening. Very moving, and encouraging. I like short chapters, and this book has short chapters that can stand alone and uplift. Very moving accounts of one doctor's counseling work among terminally and chronically ill people. This is another one of those books I would classify as "Pop Religion", and, being a devout religionist myself, perhaps had a reaction to it similar to that of a real scientist to any number of the "Pop Science" books that top the charts. As far as the book is concerned, the same non-points and not-so pithy platitudes were repeated over and over again using only slightly varying personal experiences from her years as a therapist as justification for her generalizations. The principles on which I This is another one of those books I would classify as "Pop Religion", and, being a devout religionist myself, perhaps had a reaction to it similar to that of a real scientist to any number of the "Pop Science" books that top the charts. As far as the book is concerned, the same non-points and not-so pithy platitudes were repeated over and over again using only slightly varying personal experiences from her years as a therapist as justification for her generalizations. The principles on which I assume the book was supposed to be founded--"service", "wholeness", "healing", "blessing"--started and ended wholly devoid of meaning. Having been so commercialized in our consumer-oriented American society, "service" means very, very little. Ms. Remen didn't take opportunity to explain what exactly she meant by this little buzzword, but proceeded to use it over and over and over. Her definition of "healing" is apparently interchangable with "acceptance", as when the surgeon who treated a woman who had committed suicide learned from the woman's husband that "she was in Heaven now", and was thus able to find "healing" when the surgeon's own wife committed suicide four years later. Is that healing? I would think healing would have been more along the lines of recognizing some strain in this man and his wife's suicide that could have changed his own relationship for the better, thus preventing his wife's suicide. Oh, man. I loved, loved, loved this book. My sister has been telling me to read this book for years and I'm glad I finally borrowed it. I so enjoyed the stories, wisdom and vulnerable truths found within. I wanted to mark and share so many parts with friends. I can't recommend this book enough if you have any interest in mind/body connections, faith, medicine or all the above. It's not too granola, churchy or new-agey--it's just right. I want to re-read it now that I'm finished. I really was touched by the sweet reflections of this author, a doctor who left conventional medicine to join a group who stresses holistic medicine, dealing with the spirit, as well as the body. She counsels with people experiencing fatal or chronic illness, as well as those doctors and nurses who treat them. Using her own experiences and what her gentle Jewish rabbi grandfather taught her as a child (he died when she was seven), she muses on the truths about living and valuing life. I don't normally read inspirational books, but Mia had this on her top-ten favorite books, and had a copy to lend. What a surprising book! What a life story Rachel Remen has -- only child of older hard-working professionals. Full of ambition and determination, even after a collapse at age 16 and a diagnosis of Crohn's disease [no cure, bad prognosis]. Her marvelous memories of her wise grandfather's caring for her and nuggets of wisdom [he died when she was 7] -- she notes that he was probably much less available to his own daughter [her mother] when she was a child. Much of Remen's book is quite short accounts of outstanding anecdotes of people dealing with severe illness, death of a loved one, and so on. Remen lectured a lot, apparently mostly telling a lot of anecdotes like these to make her point that mind and body are interrelated, and mind/feeling can play a large role in getting well. She discusses how new [and rejected] this idea was when she first started lecturing on it in the 1970s[?] to doctors and nurses. Reading several of these anecdotes really gives a good impression of the mind-body linkage, or of the spiritual side of health and illness, if you will. COMMONWEAL is the organization [near San Fran] started by Michael Lerner [Tikkun] where Rachel set up her integrative medicine programs and counseling. See her own website too, which has several of the stories from this book. One is below, another two I have as WORD docs in my Documents folder. I began to laugh. “That rock sounds just like my father,” I told her. “And mine,” she said and asked if I could hear the other side of the conversation—-“What was the bulb saying?” “I need to bloom,” I told her. “Blooming is my whole purpose for being alive.” She frowned. “It should feel good to have that rock between you and danger, shouldn’t it?” she asked, “ But it doesn’t, really.” Suddenly my eyes filled with tears. I had no idea why. We let the matter drop there. From time to time I would think about it, and once I dreamt it again. It was just as disturbing. Some years later I was agonizing over a major career change. The stress of this decision became intense, and one morning I awoke with a severe pain in my back. After the third or fourth day, I went to see my doctor, who told me that the pain did not correspond with anything anatomical he knew about. The pain went on for weeks. Finally someone suggested I consult an acupuncturist …This was not the usual thing to do at that time, but I had become desperate and so I had gone. Dr. Rossman ran his finger lightly down my back. When he touched the place that was hurting, the pain was so intense that I cried out. “Ah, he said, “ this is an acupuncture point. The life energy is stuck here.” … As soon as I felt the needle, the old, half-forgotten image of the daffodil bulb and the rock reappeared to me with extraordinary clarity. Suddenly I understood how the rock felt. The rock was afraid to let the bulb bloom. It knew the daffodil’s value and was determined that it must not come to harm. If it bloomed and became visible, it could be hurt. I also understood for the first time that if it did bloom, the daffodil might die. Survival was a high priority in our family. My father, and indeed many other members of my family, had been made fearful of life by the Depression and the war. They had become experts at surviving. Surviving was a question of tenacity, of putting safety above all other considerations. Living, on the other hand, was a matter of passion and risk. Of finding something important and serving it. Of doing whatever was needed in order to live out loud. As a child of my family, I had not understood the difference in this way before. Perhaps survival was not the goal of life at all. As I anxiously began to wonder if it was possible to protect something without stopping the life in it, in my mind’s eye the rock spontaneously began to change its shape. As I watched in surprise, slowly it became taller and thinner and more transparent until I realized it was becoming a greenhouse. Inside it, the daffodil bulb put out a spike and bloomed. The yellow of the flower was extraordinary—as if it were made not of petals but of light. Lying there on Dr. Rossman’s table, I began to weep. In the blink of an eye, things had turned inside out. The reason the rock had given the bulb for not blooming was the very reason it was important to bloom. It was a dangerous world, a world of suffering, loneliness, and loss. Daffodils were needed. My family had actually cultivated fear. After I was bitten by a stray dog as a child and underwent a painful series of rabies shots, I became terrified of all dogs. My father encouraged this, believing that it would keep me safe. It had never occurred to me before that fear might be the wrong sort of protection. After the first treatment, my pain never came back. When I revisited Dr. Rossman to discuss this with him, he told me that the acupuncture point where my life energy had been blocked was called the “Heart Protector”. Shortly afterward, I left my secure and respectable faculty position at Stanford and moved down the peninsula to join with others who also dreamt of finding a new way to practice medicine. Perhaps finding the right protection is the first responsibility of anyone hoping to make a difference in this world. Caring deeply makes us vulnerable. You cannot move things forward without exposure and involvement, without risk and process and criticism. Those who wish to change things may face disappointment, loss, or even ridicule. If you are ahead of your time, people laugh as often as they applaud, and being there first is usually lonely. But our protection cannot come between us and our purpose. Right protection is something within us rather than something between us and the world, more about finding a place of refuge and strength than finding a hiding place. I absolutely loved this book! The author is a cancer physician who counsels with people dealing with cancer. Though raised by almost athiest parents, her grandfather secretly taught her of his beliefs as an Orthodox Jew while she was a young child. It is so beautifully written and speaks of the kindness and goodness of humanity, of finding joy,awe and peace in the midst of our trials interwoven with her beliefs. She shares many different stories that she has learned from those she has come in co I absolutely loved this book! The author is a cancer physician who counsels with people dealing with cancer. Though raised by almost athiest parents, her grandfather secretly taught her of his beliefs as an Orthodox Jew while she was a young child. It is so beautifully written and speaks of the kindness and goodness of humanity, of finding joy,awe and peace in the midst of our trials interwoven with her beliefs. She shares many different stories that she has learned from those she has come in contact with in her life. There are so many beautiful little quotes throughout the book but my favorite is the following because it speaks of the beauty and wonder of this life which I need to remember and regain the awe that my life deserves. I cried my way through many chapters, I don't know if this is because I read it in the weeks following my surgery, but it touched my soul. "Days pass and the years vanish and we walk sightless amoung miracles. Lord, fill our eyes with seeing and our minds with knowing. Let there be moments when your Presence, like lightening, illuminates the darkness in which we walk. Help us to see, wherever we gaze, that the bush burns, unconsumed. And we, clay touched by God, will reach out for holiness and exclaim in wonder, "HOW FILLED WITH AWE IS THIS PLACE AND WE DID NOT KNOW IT!" This book contains some lovely true stories and insights. Based on the title, I wouldn't have expected to like it. But actually only a small portion of the book is about the author's grandfather. The majority of the book is 2-3 page chapters telling stories about something that happened to the author or someone she knows. The author, Remen, is a doctor who counsels people with cancer and has had a life-long chronic illness herself. Because of this, she has spent a lot of time thinking about what This book contains some lovely true stories and insights. Based on the title, I wouldn't have expected to like it. But actually only a small portion of the book is about the author's grandfather. The majority of the book is 2-3 page chapters telling stories about something that happened to the author or someone she knows. The author, Remen, is a doctor who counsels people with cancer and has had a life-long chronic illness herself. Because of this, she has spent a lot of time thinking about what really matters in life, how to be authentic, how to truly serve others, etc. A running theme throughout the book emphasizes the value of every life and how every kind action, no matter how small, can have a big impact. Although I didn't love every story, I appreciated that the chapters were so short. If one chapter didn't strike a chord with me, it was over quickly and I could try again with the next one. That being said, there were several stories that I found to be quite profound. My sister gave me a copy of this book, so I was able to highlight certain passages and stories, and I know I will refer to them again in the future. Because the book contains so many stories, each person who reads it is likely to be moved by several of them - or more. Not being a novel with a plot, I found it difficult to get around to reading this book. But, that being said, once I did pick it up, I enjoyed it. There were many inspiring passages and wished I weren't reading a library copy so I could underline and mark up the book. However, by the middle of the book I realized that I had forgotten most of the "inspiring" passages. I think this was due to there being just too much to remember and retain. Maybe if I were in the medical field or going through a Not being a novel with a plot, I found it difficult to get around to reading this book. But, that being said, once I did pick it up, I enjoyed it. There were many inspiring passages and wished I weren't reading a library copy so I could underline and mark up the book. However, by the middle of the book I realized that I had forgotten most of the "inspiring" passages. I think this was due to there being just too much to remember and retain. Maybe if I were in the medical field or going through a medical crisis, I would have been able to relate to the book better and retain more. I really think that every medical professional should read this book. I love how the author, a medical professional herself, acknowledged that there are some things that science cannot explain, and that it is this very mystery that gives life meaning. Recommends it for: Anyone who is seeking the deeper meaning of life. Recommended to Karen by: My daughter - who had to read it for a class at college. Rachel Naomi Remen works as a Psychiatrist she is Co-Founder and Medical Director of the Commonweal Cancer Help Program. 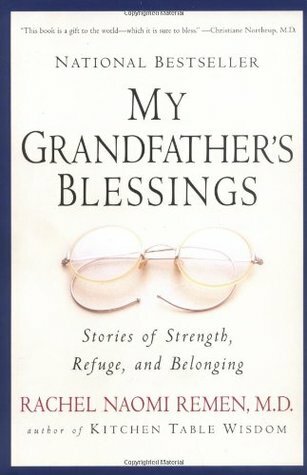 My Grandfather's Blessings is a compilation of stories, each independent of the other. The book can be read out of order and used to focus thoughts before meditation. I love this book better than her book Kitchen Table Wisdom because it tells so much of her grandfather's influence on her life. I have read the book until it is falling apart! I come back to it for nourishment in Rachel Naomi Remen works as a Psychiatrist she is Co-Founder and Medical Director of the Commonweal Cancer Help Program. My Grandfather's Blessings is a compilation of stories, each independent of the other. The book can be read out of order and used to focus thoughts before meditation. Unlike many in my book club, I loved this book. It is a perfect bathroom book too as the chapters are short and you can get uplifting thoughts in short segments. I loved the quote "And God said, Let there be light. He is speaking to us personally. He has given us to not only carry the light, but kindle and strengthen the light in one another, passing the light along. This is the way God's light will shine forever in this world." And, "we are here to grow in wisdom and to learn to love better." If I was asked to choose a favorite book, that would be very difficult for me, but I would have to favor this one. The stories of courage and inspiration are phenomenal! I dare anyone to read this book and not see yourself or those you know walking through Rachel's beautifully written words. Rachel is an author that I would truly love to meet. What a thrill it would be to sit down and discuss life with this wonderful woman! Beautiful reminisces of a physician and her patients and the wisdom she learned from their suffering. Wisdom from her Rabbi Grandfather, who taught her while very young. Short anecdotes of lessons learned from a variety of places and circumstances. This is how I have envisioned recording all the wisdom I learned teaching K for 25 years. My notes and stories are still in a box in the basement. I may try putting them in print. This book is full of inspiring stories! It's not something you can read quickly, at least I couldn't. It's the type of book that you will want to read again so you can remember the stories and share them with others. I like that each chapter is a short, complete thought that teaches a small gem of wisdom. It will make you think deeply about life. I only gave it 4 stars because I would say I really liked it but I didn't love it, I prefer reading other genres. Overall it's a great book! Don't let the introduction to this book put you off -- once you get into the beautiful little gem-filled chapters you will love it. So many words of wisdom in there I started taking notes. I may have to buy myself a copy so I can mark it up with highlights and remember the stories behind each priceless treasure! I really enjoyed this book. I found lot of wisdom in her writings. I usually struggle with the self-help, motivational books. However, this book was touching and nice to read. I had to read it in small doses, but I learned from the ideas shared. I tried to read the book, and I did not like the book; the collection of stories. Now I found it was not the collection of small talks. The reason I decided to challenge this book this time is a little silly and childish. When I checked my stats of my goodreads.com, it was said that I had read 9750 pages and I wanted to make it over 10,000 and I decided to continue reading "My Grandfather's Blessings" since I read more than 130 pages already. When I read it without stopping, the book looked so different. I fell in love with the book and I wondered why the book was so different. I was prejudiced against the book. And this experience led me to think, I am afraid, that I must be much prejudiced about people as well. while her strong father opposed it as her physical condition was very poor after awakening from coma. Her mother said, "I was terrified for you, but I was even more frightened for your dreams. If they died, this disease would have claimed you." Her mother allowed her to choose her own life and Naomi became a great physician, author and counselor. Each episode Naomi introduced is very touching but it is the part of Mary I shed tears, since I have a friend who lost her child son by car accident. Mary lost her son, 20 years old, due to untreatable cancer. She was not religious then and suffered a lot from her son's death. She went with her brother to a Catholic church she had never visited before and stopped before a statue of Mary. She asked aloud. "How could you surrender your son? How could you find a way to live after he died? Where is there any hope of comfort?" Then she found the mystery that she was comforted from that experience. Life is filled with mysteries and we have power to find them. I watched Dr. Remen on thirty minutes' Youtube as I liked her book a lot, and I found she looks a lot more beautiful than her photo in her youth. And her talk is very impressive as well. I will read her another book, "Kitchen Table Wisdom" and watch more of her programs. Her books and talks are filled of wisdom of life and soul. I will attach below what I found on the website. I became acquainted with Rachel Naomi Remen through her On Being interview (https://bit.ly/2TP5EpR). I was instantly fascinated with her take on the difference between healing and fixing. During the interview, Krista Tippett, the host, mentioned one of Remen's books, My Grandfather's Blessings. So I picked it up. In the beginning of her book, Remen writes about the relationship she had with her Grandfather. As a young girl, Remen had the opportunity to hang out with him almost daily. And for a fe I became acquainted with Rachel Naomi Remen through her On Being interview (https://bit.ly/2TP5EpR). I was instantly fascinated with her take on the difference between healing and fixing. In the beginning of her book, Remen writes about the relationship she had with her Grandfather. As a young girl, Remen had the opportunity to hang out with him almost daily. And for a few hours, in between the time school let out and her mother (a public health nurse), came home from work. Remen captures the wisdom of her grandfather, who was an orthodox rabbi and a scholar of the Kabbalah. Remen's parents were both socialists and agnostics, so his perspective was decidedly different. Remen has struggled with Chron's disease for over 65 years, and endured eight major surgeries. She is also a M.D. But her specialty is listening to and counseling patients with chronic and terminal illnesses. She is also the co-founder and medical director of the Commonweal Cancer Help Program in Bolinas, CA. While this may seem like a lengthy introduction to a book review, in Remen's case it's important. There are hundreds of thousands of self-help books out there. Remen's isn't one of them. My Grandfather's Blessings is a wonderful blend of story-telling, practical wisdom gleaned from living and a look at the mystical connection between body and spirit. "I've spent many years learning how to fix life, only to discover at the end of the day that life isn't broken. There is a hidden seed of greater wholeness in everyone and everything," she writes at one point. A few pages later she notes "I was stunned to find that many of the things most worth knowing are not written in books, or observed through scientific effort. They are known by people who have been to school but just as often known by people who have never been to school, by people who can read and by people who have never read a book in their lives. It came as a shock to discover that in order to live well you might need to learn to read life." Remen gives us a lot to chew on. Her book is a like chocolate cheesecake, with chocolate frosting on top. Here's one last sliver of a slice, in hopes you'll want more! Life h In My Grandfather's Blessings, Rachel Naomi Remen, a cancer physician and master storyteller, uses her luminous stories to remind us of the power of our kindness and the joy of being alive. Rachel Naomi Remen is a doctor, formerly a pediatrician and later a psychiatrist (or is it psychologist) specializing in cancer patients. She also has sort of a sub-specialty dealing with other doctors. This book is a collection of short stories and short meditations dealing with the concept of service and ideas of healing. The author uses everything from stories her grandfather told her as a child to the experiences of her patients and fellow physicians. Each sto Recommended for almost everybody. This book is a collection of short stories and short meditations dealing with the concept of service and ideas of healing. The author uses everything from stories her grandfather told her as a child to the experiences of her patients and fellow physicians. Each story is exquisite, and some are almost painfully beautiful. All reinforce the value of human life and the value of supporting it and show us how we might do that. I cannot rate this book highly enough! The stories in these pages are so poignant, heartfelt and even mysterious. I only read a few each morning; they are like the best dark chocolate I've ever eaten and I wanted them to last. Dr. Remen shares stories from her grandfather and of her medical practice as her patients suffer through cancer diagnosis, treatment, and facing death. But this is not a cancer story; rather it is one of teachers on the path of life: suffering, redemption, forgiveness, hop I cannot rate this book highly enough! The stories in these pages are so poignant, heartfelt and even mysterious. I only read a few each morning; they are like the best dark chocolate I've ever eaten and I wanted them to last. Dr. Remen shares stories from her grandfather and of her medical practice as her patients suffer through cancer diagnosis, treatment, and facing death. But this is not a cancer story; rather it is one of teachers on the path of life: suffering, redemption, forgiveness, hope, love, belonging, wisdom, and finding our way, our purpose, and our meaning.